According to Google, this is the most popular smoothie with slightly over 10,000 people a month searching for “strawberry banana smoothie”. Below you’ll find what you can use to make an extremely healthy version of this classic and wildly popular smoothie recipe. The possibilities and variations are endless. The vanilla version of this smoothie is as simple as it gets with just three ingredients, but for me this is where the fun begins. You could add in a green leafy vegetable like spinach, kale, lettuce, or beet greens and instantly have a delicious green smoothie. Or turn this into a superfood smoothie with the inclusion of cacao (raw chocolate), maca, coconut oil, and/or bee pollen among others. My unique twist on this recipe is to use kefir as the base, something I’m a huge proponent and consumer of. Kefir is typically made from fermenting milk, but coconut water can also be used. Kefir is a traditional fermented beverage that literally means “feel good” in Turkish. It’s teaming with friendly and beneficial bacteria that are vital for a healthy digestive tract. It’s also rich in protein and has a tangy taste I absolutely love. If you’re interested in making your own kefir at home, Sarah over at The Healthy Home Economist has a great how to video. 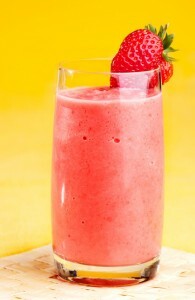 Time to take the uber popular strawberry banana smoothie to all new levels of health and tastiness. Put all the ingredients into your high speed blender and blend for 30-45 seconds or until the desired consistency is reached. Please leave a comment below if you like this smoothie recipe. Happy Blending!